Below are some resources for planting, gardening, landscaping, advocacy and DIY projects. Please check our Facebook Page to stay updated on the latest local, national and international pollinator news. The University of Maine recently published new research on Bees and Their Habitats in Four New England States — an excellent resource for advocating for pollinator habitats. This is a nice guide with a number of articles and resources. KidsGardening is a national nonprofit creating opportunities for kids to learn through gardening. This website offers a nice overview of Environmental Education, along with some additional links and resources especially for kids. The Meadow Project’s mission is to educate and raise awareness about sustainable, native, healthy, easy and affordable land care practices that support wildlife and human life. Materials include Hometown Habitat, Stories of Bringing Nature Home, a 90-minute environmental, education documentary and the book and companion DVD Urban & Suburban Meadows. Download printable templates here: Garden.Sun.Template and Garden.Shade.Template. When you visit your favorite local nurseries, be sure to encourage growers to stock native, pesticide-free pollinator-friendly plants! Please contact us if you have other resources we should list! A great resource for returning native plants to the Maine landscape and assuring that your seeds and plants are pesticide-free. Wild Seed Project blog post on creating a landscape in Maine to support Monarch butterflies and other pollinating insects. Wild Seed Project blog post on creating pollinator habitat for urban dwellers. Local Maine plants and veggies grown with no pesticides. River Berry Farm in Vermont is an online regional provider of native perennials that have been carefully selected to ensure each is of special value to native bees and bumblebees, our most important pollinators. They will ship to New England states and their site also has great guidelines and other info. The Society operates a native plant nursery at Nasami Farm in western Massachusetts and owns seven native plant sanctuaries in Maine, New Hampshire, and Vermont, six of which are open to the public. Native Haunts, in Alfred, Maine, offers organic nursery production in the form of native plants and seeds, as well as consulting and landscape services. We have been told that all flowering annuals in paper pots have been grown from organic seeds and are not treated with any chemicals in both the Falmouth and Cumberland locations. Great selection of petunias, snapdragons, and many others. Large selection of native plants. Our research shows that plant starts may not come from pesticide-free sources. Plants are organically grown once received. Experienced wildlife ecologist Deborah Perkins works with clients to customize habitat designs and make site-specific recommendations to create beautifully biodiverse places that support wildlife. This site also has an amazing blog. David Homa is a local king of permaculture and original member of Portland Permaculture Meetup, a precursor of the Resilience Hub. He runs a business dedicated to ecological landscapes and permaculture design. New gardening business in York County that is focused on food, medicine, and pollinators. Info about edible landscapes, herbs and more. 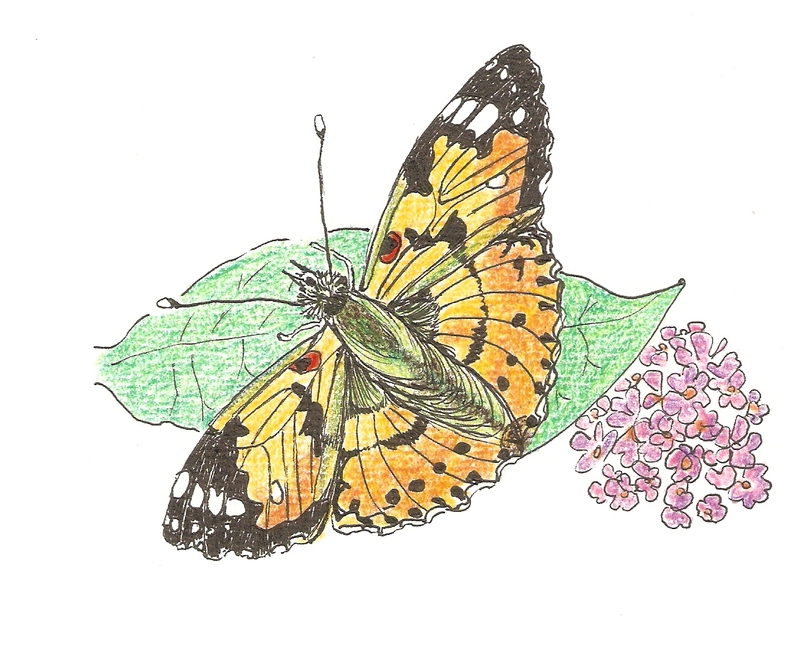 This is a great website on what you need to do to build a successful butterfly-friendly garden with lots of other resource links. No space? Explore vertical gardening. Got Weeds? is a Vermont company that uses manual and non-synthetic control methods to eradicate, contain, or suppress non-native invasive plants. It was founded in 2011 on the notion that hard work does pay off when coupled with a pro-active, informed approach to understanding natural systems. The idea that fine-tuned ecosystems can be protected with vigilance, persistence, patience, education, humility, respect, and cooperation is central to the philosophy at Got Weeds?. Started by two moms fed up with their kids being exposed to pesticides in Portland, Maine, Portland Protectors grew to a large network of more than 500 people working to create one of the strongest most comprehensive city-wide synthetic pesticide ordinances in the country to assure all the people who live in, work in and visit Portland are safe from exposure to synthetic cosmetic lawn chemicals. This is an excellent national organization that works with allies in protecting public health and the environment to lead the transition to a world free of toxic pesticides. Many great articles and resources. A useful and thorough guide to protecting your garden without toxins. The Friends of the Earth have some great environmental policy reports available, especially: Buzz Kill: How the Pesticide Industry is Clipping the Wings of Bee Protection Efforts Across the U.S. (Food and Technology). This report has found that the pesticide industry is stifling urgently needed reforms that would help these essential pollinators survive and rebuild their numbers. The Maine Board of Pesticides provides information about how to communicate with neighbors who use pesticides and/or how to add your name to the Maine Pesticide Notification Registry to be notified of outdoor, non-agricultural pesticide applications in your vicinity. This is especially useful for suburban and urban residents. Get close to nature. The state’s oldest and largest wildlife conservation organization connects people to nature through a science-based approach to conservation, education, and advocacy. Events include an annual Pollinator Parade and a Native Plant Sale and Festival. Eight wildlife sanctuaries include Gilsland Farm in Falmouth, Maine, 65-acres including trails. This excellent article published by the Maine Organic Farmers and Growers Association (MOFGA) was written by Heather McCargo, Executive Director of the Wild Seed Project. It describes how to create sustainable native pollinator habitat. The Southern Maine Conservation Collaborative was founded in 2012 as a service center to assist conservation organizations in southern Maine with hands on assistance specific to organizational needs. They also serve to build connections within the conservation sector, and between conservation and broader community issues. The Cumberland County Soil & Water District has a website page on YardScaping that includes a list of recommended companies to use to help maintain your lawn or garden without using dangerous and unnecessary pesticides. The YardScaping Gardens at Back Cove are a model project of beautiful, sustainable garden landscaping and community cooperation developed as a demonstration garden that enhances water quality and is safe for people, pets, and wildlife. This University of Maine Cooperative Extension bulletin provides just about anything you might want to know about native bees, including profiles of Maine species; advice on how to make your yard “native bee” friendly; and a list of annuals, bulbs, biennials, perennials, shrubs, and trees that provide rich bee habitat. The bulletin also tells you how to create your own bee houses. Don’t forget the butterflies! Many of the plants that support native bee populations will also attract butterflies, but this bulletin published by the University of Maine Cooperative Extension provides many details about some of the Maine butterfly species and how to develop a suitable habitat for them throughout their life cycles. This University of Maine Cooperative Extension publication lists non-native plants considered most invasive in Maine and a list of native plant recommendations. This U.S. wildflowers database includes photographs and descriptions of Maine’s wildflowers, both native and introduced. Doug Tallamy is a professor in the Department of Entomology and Wildlife Ecology at the University of Delaware, where he has authored eighty research articles and has taught Insect Taxonomy, Behavioral Ecology, Humans and Nature, and other courses. Chief among his research goals is to better understand the many ways insects interact with plants and how such interactions determine the diversity of animal communities. His book Bringing Nature Home was awarded the 2008 silver medal by the Garden Writer’s Association. Watch A Chickadee’s Guide to Gardening talk at Maine Audubon. Mason Bee Revolution: How the Hardest Working Bee Can Save the World One Backyard At a Time by Dave Hunter and Jill Lightner explains how docile, hard-working, solitary mason bees (and their compatriots, the leafcutter bees) are even more productive pollinators than honeybees, and keeping them can be a fun, easy, backyard hobby for gardeners, conservationists, foodies, and families everywhere. Founded in 2007 by the Center for Biodiversity and Conservation at the American Museum of Natural History and the Greenbelt Native Plant Project, this site is a wealth of information. Its Education page provides curricula on pollinators and pollinator conservation suitable for K-12 students. The North American Pollinator Protection Campaign (NAPPC) is the most important project managed by the Pollinator Partnership. Based in San Francisco, it is a collaboration of individuals and organizations representing all aspects of the pollinator issue. Since 1999 this group has worked tirelessly to promote and protect pollinators and the agricultural and ecological services they provide. A wealth of resources, including planting guides for a variety of regions, can be found here. This is a nonprofit organization that protects wildife through the conservation of invertebrates and their habitat. They use advocacy, education, and applied research, publish articles on insect conservation, trained farmers and land managers to protect habitat, and much more. Want some visual inspiration? This blog page has some creative examples of bee walls and houses, including functional sculptures. Yes, there’s an app! Available on both Android and iOS platforms, it allows you to browse through a database of nearly 1,000 plants, by region, soil type, color preference, and more. Not good with wood? A variety of houses are available for sale at a range of prices. Please visit our Facebook Page for more news, updates and articles.